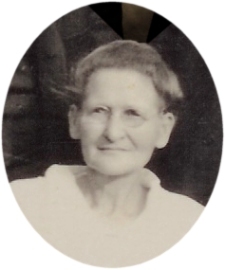 Caroline Goebel was born at Scranton, Kansas, March 17, 1871 and died September 29, 1930, she was married to John Lambert Pogson of Scranton. To this union four children were born; Edna E, who precceded her mother in death some ten years ago; Mrs. Elizabeth Jackson of Burlingame, Kansas; John L. Pogson of ? Missouri, and Mrs. Amelia Carnes of Topeka, Kansas. Mr. and Mrs. Pogson came to Burlingame about two years ago on account of her failing health, and during this time she was a courageous and patient invalid. Only last Spring they bought a little farm home in the West part of town just over the Old School Hill. On account of her illnes she was taken to the home of her daughter, Mrs. Earl Carnes in Topeka about two weeks before her death. Hymns used in the funeral service were "Does Jesus Care", "The Old Rugged Cross", and "Drifting Down the Valley." Read the entire obituary for more information.